Richard Russo is at home among hopeful losers, people who keep going through life even though life keeps knocking the hell out of them. While few of his characters are what you or I would call intelligent, they’re all smart enough to realize that the odds are stacked against them. Russo loves to visit even further indignities on these people and even has the audacity to wring humor out of their struggle. Everybody’s Fool is a sequel to Russo’s 1993 novel Nobody’s Fool, which was turned into an excellent movie starring Paul Newman and featuring Philip Seymour Hoffman in a small role. It’s a shame neither of those terrific actors are around for a potential sequel. Newman’s Donald ‘Sully” Sullivan is still a rascally old-timer and chronic underachiever, willing to work hard but only if the pay is good and under the table. Nowadays however, Sully has been on an unprecedented run of good luck. After inheriting his landlady’s house and mostly repairing his relationship with his son, Sully is on the verge of stability. Luckily he can still indulge his ne’er-do-well side by torturing his best friend Rub (mostly by giving his dog the same name and reveling in the rampant confusion) and getting under the skin of every S.O.B. who crosses his path. Raymer is affected by his knowledge of his late wife’s plans to leave him for another man, and distracted because he can’t figure out who it is. A garage door opener found hidden in her car is his only clue, until a moment of inspiration at his wife’s graveside points him in a surprising direction. We get more than just Sully and Raymer. Russo’s panoramic style leaves him room to explore the inner lives of most of his characters, all of whom seem to be the products of broken homes and poor decision-making. However, Russo also knows how much is beyond his characters’ control. He knows that they live in a town left economically depressed by an environmental fluke and greedy corporations, and that getting out and getting ahead are easier said than done. Russo is clearly most comfortable with his milieu of white men, and though he does fair with the novel’s handful of African-American characters the reader doesn’t get the in-depth portrait of them that they deserve. He does better with hardscrabble women, like the owner of the local diner desperately trying to keep her daughter away from the abusive boyfriend whose just gotten out of prison again. More unnervingly, he takes us inside the mind of the abuser whose limitless capacity for rationalizing his abhorrent behavior is truly scary. There are a lot of plots introduced and not all of them are wrapped up neatly. Perhaps this is to leave room for further novels, or perhaps it is an acknowledgement that in real life stories are generally a little shaggier than they are in literary fiction. If it’s a criticism to say I wish there was more of this book to read, then it is just a mild one. 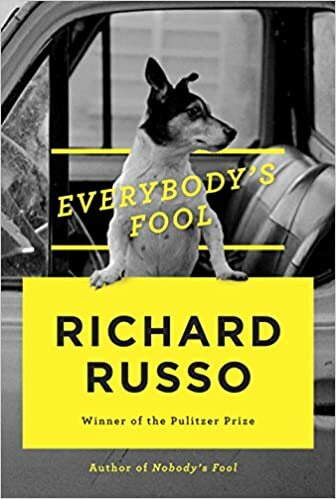 I might have liked more resolution, but Everybody’s Fool is a funny, engrossing book and a worthy sequel to its predecessor. Share the post "We’re Not Happy Until You’re Not Happy"
I’m a big Russo fan. Can’t wait to read this sequel! I had no idea there was a sequel to this. I’m so out of touch. I’m going to go find this book! HUGE Russo fan! Fun fact: He based Straight Man after one of my creative writing professors (minus the infidelity) who was one of his best friends. I can’t wait to read this! He came to our class to discuss Nobody’s Fool and watched the film with us. Best experience ever! !